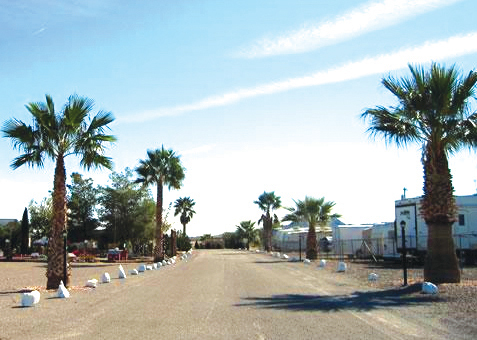 The warmth of the desert, surrounded by mountains and beautiful desert scenery, and plenty of time to relax and enjoy it, await visitors at the Desert Vista KOA Campground in southwestern Arizona. Quartzsite, home of the internationally famous gem and mineral shows in January and February. Kofa and Castle Dome Mountains surrounded by the Kofa National Wildlife Refuge. Mining ghost town of Wickenburg. Fireside Cowboy Supper Club. Outback chili cook-off. Petroglyphs 2 miles from resort. Clubhouse, hot tub, laundry facilities, outdoor spa, heated swimming pool, picnic area, WiFi, hiking, horseshoes, miniature golf, pool table, puzzles, library, planned activities. Reservations required for RV sites and may be made up to 90 days in advance through RPI's Central Reservations Office. Peak season is December 1 - March 31. -50 amp service is $5 when available. Adapters are not allowed be used to in orde to convert power. Rigs over 40 ft. will automatically be placed on a 50 amp site. Cancel 48 hours prior to check in to avoid a $10 fee. GPS: 33.760976, -113.649419. Get directions from Google Maps.